I had my jog this morning. And did you know that listening to music is a good way to keep you motivated to jog for longer minutes? Not only jogging, but in all workouts, especially when you're working out solo. I use my Nokia 5310 XpressMusic to listen to music, pretty much all the time. Having mentioned that, guess what? My phone jumped out of my pocket while I was jogging this morning! Now my phone has a tiny, tiny dent & scratch on the top right part of its housing. As of the moment, I don't have a separate music player from my personal phone, but that would be so much better. But for now, I'm satisfied, except for when I'm working out. I should have put on a silicone case I had but I didn't. I realized that I seriously needed something to keep my phone in place while I'm working out. Now, armband is a piece of accessory that is worn around the arm (that's how they got the name). Nokia 5310 XpressMusic is not a sports phone, but to be named one of many music phones, they should have thought of selling products like that. This simple accessory can very useful for people who are music lovers and are on the go all the time, particularly if you are leading a healthy & fit lifestyle (e.g. jogging, working out at the gym). Now choosing option number 2 above, I tried searching in stores here in Philippines but was unfortunate to find any on stock. So, I tried to search on Google to see if there were any available armbands for my phone and only found one of its kind, the Sports Armband Case from MobileFun.co.uk for £7.97. If converted to Philippine Pesos, that would be around PHP500. Sadly, they don't ship here to Philippines, plus they discontinued to sell the product. The appearance itself has a comfy, sporty, stylish look to it, giving the Nokia 5310 XpressMusic a snuggly fit when you insert it in the phone holder. The armband also has an adjustable strap attached. Yes, having a silicone case has a rubber feel to it. But it is not the same when you're listening to music and jogging or working out, with the feeling of your phone in your pocket compared to it being snuggly and fit on your arm. Not to mention that you have better access than with it in your pocket. 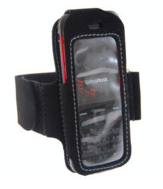 If you are thinking of hitting the gym or just working out at home, then an armband is definitely a must!